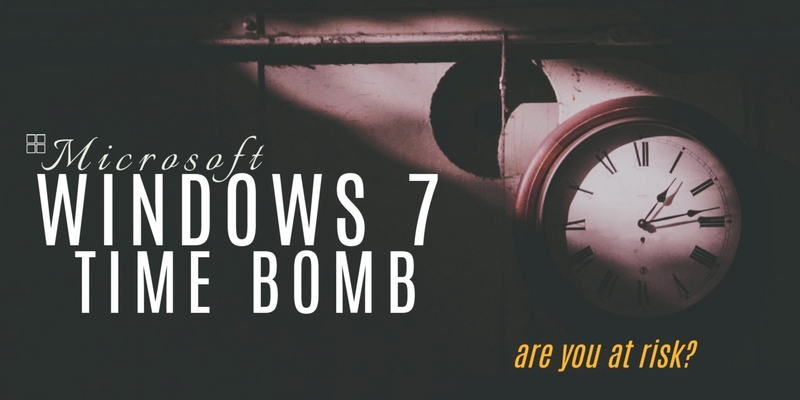 Microsoft Windows 7 to 10 Upgrade, are you at risk? Stay with Windows 7 and take the risk of a security breach. However most organizations will fear infection by malware, loss of IT services and associated ransomware demands. Stay with Windows 7 and try to obtain extended security support however this will cost extra and is likely to be only made available to larger organizations. Update technology to Windows 10. This may sound a sensible approach but for many organizations the transfer can be a challenging project. When upgrading to Windows it is not only a matter of updating the operating system. Some devices currently running Windows 7 will be old and not of a correct specification to run Windows 10. In which case they will need to be replaced. Even if the device can be upgraded there may be application incompatibilities which means they will not work correctly with Windows 10. These tasks are challenging enough however for many organizations they will have the added problem of incomplete inventories, poor software licensing records and the inability to test and package large amounts of software applications for re-installation. Resolving these issues can be a can be a time consuming and difficult task, so how can this be done in such a way as to reduce the time and expense of the process? Obtain a complete inventory of the estate devices including their specifications and install dates. There are many reasons why existing inventories can be out of date or incomplete, so it is essential to run a discovery scan to find the devices and create an accurate inventory. Avoid the use of agent-based discovery tools and instead run scripts or agentless scans. You can then use the new complete inventory to compare the device features to the required specifications for the Windows 10 compatibility. Any devices which do not meet this specification will need to be replaced. Part of the device scan and inventory will be the identification of the operating systems and in particular the Windows 7. However the full list of versions of operating systems will be useful for ongoing support and maintenance. In addition to operating systems the complete inventory will show the full list of applications and versions. This list may not be fully understandable so running this it against a recognition facility will create the useable or normalized list of applications which is needed for software asset management and licensing. The normalized application inventory is really the starting point of the transfer process. The next step is rationalization of applications. This means identifying which application have to be transferred, those that are not necessary and those which cannot be transferred. There will be many applications which are duplicates in which case a decision can be taken to standardise on just one and get rid of the duplicates. If a company is moving to Office 365 there is often an opportunity to remove many older applications that are now included in the Office 365 facilities service. Another key step is remediation and identification of what can be moved to cloud services. The right tools will automatically remediate and show how applications can be moved to Windows 10 and also which ones can be moved to corresponding cloud services. Once these steps have been undertaken a project list of software updates and transfers becomes available. Application packaging services and facilities which transfer application to the cloud will speed up the process. The work done in getting the accurate inventory in a rational and remediated form will pay great dividends in terms of both time and cost. TBSC provides Windows 7 to Windows 10 transition service. This service includes a 7 step process to ensure a smooth and easy migration. Our approach includes: machine discovery, accurate inventory, application recognition, application rationalization, application OS collision detection, application collision remediation, and application integration detection. For more information on Windows 7 Migration, please click here for our solutions page. Roger Williams on Is Under Licensing or Over Licensing Worse? Maarten Karnekamp on Is Under Licensing or Over Licensing Worse?